A cross section of our recent experience includes: Design and construction control surveys for site and building layout of the Hilton Garden Inn located in St. Charles, Illinois; Design survey, Subdivision platting, site construction control layout for Hampshire Highlands a 115 Acre residential subdivision in Hampshire, Illinois; Control survey for interior reconstruction of the Pheasant Run Theater, St. Charles, Illinois; and layout of the Golf Course and Residential Community of Stonehenge at the Merit Club in Gurnee, Illinois. 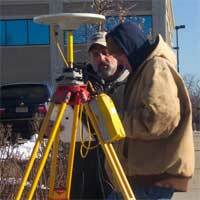 Our surveys are performed using conventional and/or GPS instrumentation. Mapping and platting is performed in the AutoCad environment. Plotting and most reproduction is accomplished in-house. We may also provide you with electronic data files for importation to your system. Layout of the Golf Course and Residential Community of Stonehenge at the Merit Club in Gurnee, Illinois.